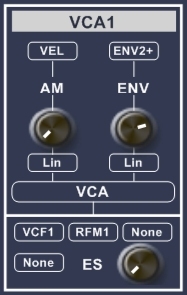 The VCA Voltage Controlled Amplifier module is the last module in the modular chain. The output of the module is permanently connected to the first effect module the HV-Panner. As the module name implies, it takes care of the amplification of the sound. At the input section at the bottom you can select 3 sound signals from the internal signal bus, see Input Terminals. At the ES section you can select an extra signal from the External Signal bus. All the sound signals are added together and amplfied according the signals and the set depth of the ENV and AM sections of the module. Normaly at this section you select a envelope signal comming from one of the ENV modules. This signal determines the main amplfication. A standard ADSR envelope signal runs from 0 to 1 and back to 0 again. Wheter the envelope signal runs from 0 to 1 or from 0 to 0.2 or 0 to 0.8 etc. is set by the ENV knob. At the terminal below the ENV knob you can set the responce type of the signal. Lin with a linear responces the ENV signal is not changed. Exp Since the human ear is not linear you can select an exponential responce. Try both responce types in combination with the enevlope curves to determine the best result. Tip! If you don't hear much difference between Linear or exponential settings than select Linear, it saves processor power. The sound signals selected at the input terminals are multiplied by the resulting ENV signal. The Amplitude modulation section works the same as the ENV section except that 1 is added to the resulting signal before it is multiplied with the input signals. Copyright Notice. This article, including but not limited to all text and diagrams, is the intellectual property of E.W. Fonken, and is Copyright © 2008. Reproduction or re-publication by any means whatsoever, whether electronic, mechanical or electro- mechanical, is strictly prohibited under International Copyright laws. The author grant the reader the right to use this information for personal use only, and further allows that one (1) copy may be made for reference. Commercial use is prohibited without express written authorisation from E.W. Fonken.